Michigan heads on the road tonight in search of its first marquee win of the 2015-16 season. Set to start a stretch of three straight games against Big Ten favorites, the Wolverines will hope to prove that their early season woes against elite teams are a thing of the past against a Purdue team that might present more matchup challenges than any other league foe. Purdue is ranked 54th nationally in adjusted offensive efficiency and 1st nationally in adjusted defensive efficiency. Michigan isn’t just playing against a great defense tonight, it’s facing the best defense in the country. Despite the impressive season-long resume, there are a few ugly markings in conference play. Purdue sputtered to two poor offensive performances against Wisconsin and Iowa, managing .96 points per possession (second worst in the league through the first week) and allowing Iowa to score 1.06 points per trip and 1.47 points per possession in a dramatic second half collapse. Michigan’s offense against Purdue’s defense is a fascinating strength-on-strength matchup. Michigan is the No. 3 shooting team in the country and Purdue has the No. 1 shooting defense. The rest of both team’s offensive and defensive numbers almost match. This Boilermaker team doesn’t force many turnovers and Michigan rarely gives the ball away. Purdue is also a great defensive rebounding team that avoids fouling while the Wolverines aren’t very active on the defensive glass or at the free throw line. When Michigan has the ball its going to come down to one of the best shooting teams in the country’s ability to make shots against a defense that makes it almost impossible to make shots. On the other side of the ball, both teams are more average. Michigan’s defense has been steadily improving and has managed great defensive rebounding numbers against average and below-average teams, but it has been pulverized in its three most difficult games against Xavier, UConn and SMU. These stats are obviously a bit skewed by the level of competition, but the numbers are still jarring. Michigan has played two of the top five offensive rebounding teams in the country in losses, but it’ll need to show some improvement on the defensive glass in West Lafayette. Purdue rebounds 35% of its misses, ranked 47th nationally, and it is much better scoring inside than out. The Boilermakers shoot 53.8% on twos (41st) and 35.2% on threes (131st), but actually attempt 40.6% of their shots from long range (62nd) despite the massive size advantages inside. Two-thirds of Purdue’s made field goals have been assisted this year, ranked 8th nationally, a sign that the Boilers do move the ball even though they have a reputation for playing massive lineups with poor point guard play. The sore spots for Purdue have been turnovers, giving the ball away on 18.6% of possessions (179th) and 23.2% in Big Ten play (13th), and getting to the free throw line. Despite the size inside, the Boilers have only attempted 26.6 free throws per 100 field goal attempts in Big Ten play (10th). Isaac Haas and AJ Hammons split the 40 available minutes at the five position and both players are dominant. Both shoot over 57% from two, are ranked in the top-150 in offensive rebounding rate and the top-75 in shot blocking. They combine to draw almost 14 fouls per 40 minutes and connect on over 70% of their free throws. Hammons has even made 3-of-3 three-point attempts this season for good measure. Caleb Swanigan is the x-factor for Purdue. He has arguably the highest ceiling on the roster, but can be inconsistent. Despite standing 6-foot-9, 240 pounds, Swanigan isn’t shy about firing up jump shots. He’s shooting 31% from three-point range, so that’s a shot that Michigan’s defense can live with. On the other hand, he has a massive size advantage over Zak Irvin and whoever else Michigan puts at the four spot, so there’s a chance that he could overwhelm the Wolverines inside. Rapheal Davis, last year’s Big Ten Defensive Player of the Year, has been locking down opposing wing guards in the Big Ten for four years now and this year is no exception. Davis grades out in the 99th percentile defensively according to Synergy Sports and opponents are shooting just 16% against him. Davis is capable of taking anyone’s best player out of the equation and giving him a shot blocker like Hammons or Haas on the help-side is almost an unfair advantage. While he plays a limited role offensively, the 32% career three-point shooter has improved his stroke this year, knocking down 42% of his three-point attempts. Vince Edwards is perhaps the most versatile player on the Purdue roster. The 6-foot-7 sophomore might play the four at many other schools, but starts at the three for the Boilers. He’s a plus passer and finisher or the wing and can also step out and hit the three. He’s shooting 52% on twos and 36% on threes for the season with a team-high assist rate of 23.1%. Sophomore PJ Thompson and senior transfer Johnny Hill split minutes at the point guard position. Thompson replaced Hill in the starting lineup five games into the season and despite his smaller stature (5-foot-9), he’s the better shooter (35% from three) and turns the ball over less often. Hill, 6-foot-3, is just 0-of-2 from long range and turns the ball over on over a quarter of his offensive possessions. Purdue surrounds its array of post talent with an interesting collection of shooters off the bench. Kendall Stephens, Dakota Mathias and Ryan Cline all attempt significantly more threes than twos, but haven’t quite gotten hot this season. Stephens is shooting 33% from long distance and is the threat to remember, especially by volume. 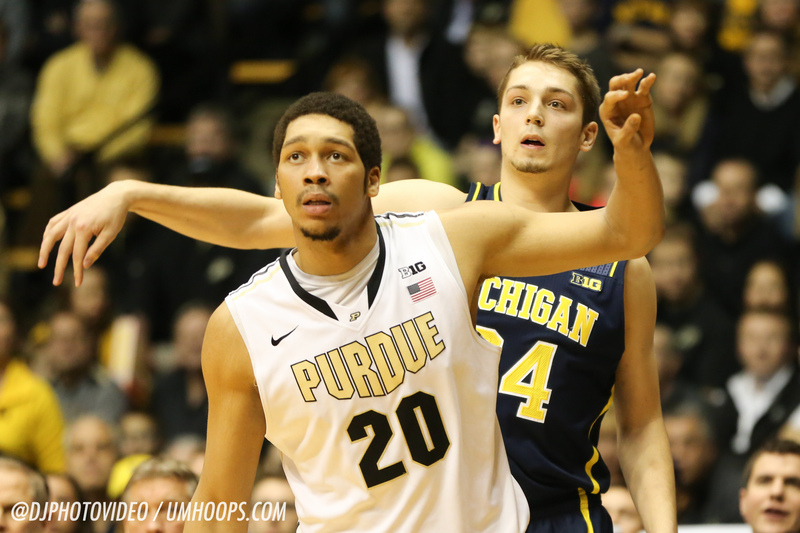 Stephens accounts for over a quarter of Purdue’s three-point makes and attempts on the season. Mathias 35% and Cline 38% are also capable shooters and have hit big shots throughout their career. They key when guarding any of the three is to get your hand out and close out and run them off the line, but the majority of their shots come off of inside-out action out of the post. None of the three are the sort of knockdown shooters that Michigan has in Duncan Robinson, but they are also a strong enough threat that it’s hard to double off of them down low. Turnovers: Michigan has been uncharacteristically sloppy with the ball through two Big Ten games, giving it away on 20.8 percent of its offensive possessions. Purdue is a team that doesn’t force many turnovers, but has had some success turning the Wolverines over in the past. On the other side of the ball, the Boilermakers have also been plagued by giveaways, turning it over on on 23.2% of their Big Ten possessions — second worst in the Big Ten. Rebounding will draw the headlines, but the turnover column could give Michigan a chance to even the game. Defensive Rebounding: Defensive rebounding against Purdue’s massive front line is the most obvious key to the game. The Boilers aren’t as good on the offensive glass as SMU and Xavier, but Michigan can’t afford to give up second chances or to deflate its offense of opportunities to push the tempo off of clean defensive boards. Find Offense: Scoring at Mackey Arena isn’t easy, especially against a defense of this caliber. The easy layups cutting to the basket and defensive breakdowns that Michigan saw against Penn State and Illinois aren’t going to happen in West Lafayette — certainly not to the extent we saw last week. Michigan is going to have a make a lot of tough shots to open up the Purdue defense and find some way to generate some form of offense attacking the basket. According to KenPom’s projected winning percentages, this is the most difficult game left on Michigan’s schedule. KenPom projects a 71-62 Boilermaker win and gives the Wolverines just a 19% chance at the road upset.